Muttahida Qaumi Movement (MQM), Chief Altaf Hussain has said that he and his party want peace, justice and emocracy in the country. He was addressing via telephone from London to a gathering of the volunteers of Khidmat-e-Khalaq Foundation (KKF), a welfare wing of his party, here on Wednesday. He said his mission is to bring a positive change in the country and lower-middle-class youth can play an important role in this regard.Altaf Hussain also greeted Eid-ul-Azha to the nation. He advised the youth to work with honest people in their respective parties. Altaf Hussain also invited the youth to join his party to bring a positive change. He said a large number of people donated the hides of their sacrificial animals to the KKF and expressed gratitude to people for donating hides to the KKF. 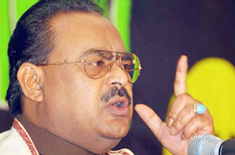 The MQM Chief said we want peace and inter-faith harmony in the country.